"We had been hoping the amazing creatures and habitats of the deep sea would get an early Christmas present this week," said Bryce Beukers-Stewart, fisheries policy officer with the Marine Conservation Society. "But once again, short-term political and economic interests have over-ridden common sense." Eleven nations have bottom-trawling fleets, with Spain's being the biggest. Studies have indicated that none would be commercially viable without government subsidies. 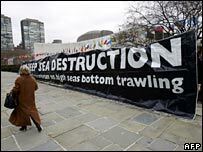 In 2004, a report compiled for the World Conservation Union (IUCN) and other environmental groups concluded that bottom-trawling was "...highly destructive to the biodiversity associated with seamounts and deep-sea coral ecosystems and... likely to pose significant risks to this biodiversity, including the risk of species extinction." The eventual deal which goes forward to the General Assembly mandates governments to adopt unilateral "precautionary measures" to ensure their bottom-trawlers do not cause significant damage to marine ecosystems. 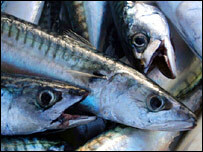 In areas covered by Regional Fisheries Management Organisations (RFMOs), "precautionary measures" must be established by the end of 2008. "The final agreement has more loopholes in it than a fisherman's sweater," fumed Greenpeace oceans policy advisor Karen Sack. "The international community should be outraged that Iceland could almost single-handedly sink deep-sea protection and the food security of future generations," said Ms Sack.